Many people, when they think of Pittsburgh, tend to think of its past as the historic center of the U.S. steel industry. Not surprisingly, the demise of that industry has taken its toll on the city. At its peak in 1943, U.S. Steel alone employed 50,000 workers in the metro Pittsburgh area. Today, it employs less than 5,000. As a result, the "Steel City" has seen a steady population decline. 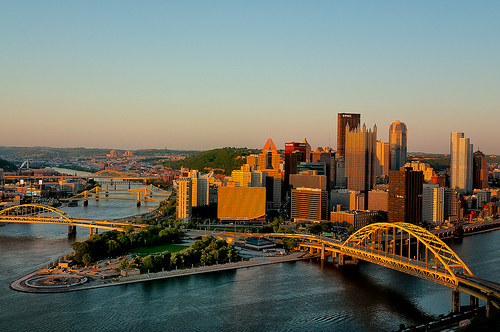 In 1950, the population of Pittsburgh was 677,000. By 2000, it had fallen to less than half that level, or 335,000, similar to the city's population level of a century before. The Census Bureau’s estimate for 2014 is even lower— 305,412. Of the current population, about two-thirds are white, 26 percent African American, with the remainder Asian, Latino, or other. Key to the city’s community wealth building efforts has been the strong support and involvement from a range of anchor institutions. For example, the Pittsburgh Foundation has a grantmaking program which focuses on developing sustainable communities and in 2013 distributed nearly $29 million in grants to nonprofits in the Pittsburgh region. Similarly, the Pittsburgh Promise, established in 2007 through a 10-year, $100 million commitment from the University of Pittsburgh Medical Center, helps Pittsburgh Public Schools System students pay for higher education with scholarships of up to $40,000. As of February 2015, the effort had awarded $57.1 million to 5,584 students. The city also boasts several strong partnerships, such as the Pittsburgh Community Reinvestment Group (PCRG), a coalition of community leaders working for economic justice, equitable investment practices, and the deployment of sufficient financial resources to revitalize communities throughout Pennsylvania’s Allegheny County. In 2011, PCRG launched its Reimagining Communities Initiative (RCI) to build capacity within distressed neighborhoods, an effort credited with raising over $1 million, leveraging an additional $6 million, inventorying the condition of 5,500 parcels, rehabbing over 100 properties, and providing more than 400 individuals with financial, foreclosure, or homebuyer counseling as of 2015. Similarly, Pittsburgh Central Keystone Innovation Zone (PCKIZ) is a consortium of higher education institutions, businesses, government agencies, and community organizations aiming to ensure the neighborhoods in central Pittsburgh can participate within the region’s knowledge-based economy. As of 2015, 41 startups in the zone were benefiting from access to tax credits, business capital, paid interns, and networking opportunities. PCKIZ is also managing and overseeing the city’s nascent Pittsburgh Wealth Building Initiative (PWBI), which aims to catalyze the creation of employee-owned/community-based businesses in low-income neighborhoods that meet the procurement and employment needs of area anchor institutions. The Forbes Funds were established in 1982 to provide emergency financial assistance to nonprofit organizations that were experiencing funding interruptions or short-term cash flow problems, but shifted over time to focus on nonprofit capacity building. In 2013, the organization adopted three priority program areas: 1) capacity building; 2) social innovation, and 3) the Greater Pittsburgh Nonprofit Partnership (GPNP), a coalition of over 400 southwestern Pennsylvania nonprofits aiming to provide the sector with a unified voice to promote social change. With grant making that averages $60 million annually, Heinz ranks among the 50 largest foundations in the country. Areas of focus for this Pittsburgh-based foundation include, education, revitalizing Pittsburgh's downtown, and fostering “sustainable innovation,” which the foundation defines as technologies that benefit both the economy and the environment. Recognizing that a place-based initiative involving significant community engagement would enable Heinz to coordinate its efforts better and have greater impact, in 2012 it launched a new initiative focused on improving the quality of life in Pittsburgh’s Hazelwood neighborhood. Projects being explored in collaboration with Hazelwood residents include a family support center, a charter school, a community center, housing improvements, and new transit options. Founded in 1945, the Pittsburgh Foundation is the 14th largest community foundation in the country with more than 1,900 individual donor funds and assets of over $1 billion. It also has its own grantmaking program that focuses on fostering sustainable communities, defined as places that seamlessly integrate economic, social equity, and environmental goals to enhance residents’ quality of life. In 2013, the Foundation distributed nearly $29 million in grants to nonprofits in the Pittsburgh region. Established in December 2007 and initially housed at the Pittsburgh Foundation, The Pittsburgh Promise is designed to help students and families of the Pittsburgh Public Schools System prepare and pay for education beyond high school at a Pennsylvania state college, with scholarships up to $40,000 for four years of college. The fund was established through a 10-year, $100 million commitment from the University of Pittsburgh Medical Center. As of February 2015, The Pittsburgh Promise had awarded $57.1 million in scholarships to 5,584 students. Founded in 1970 as Central Northside Neighborhood Council, Allegheny City Central Association (ACCA) aims to enhance the quality of life of all Central Northside residents. In 2010, ACCA kicked off the redevelopment of the Garden Theater Block, a corridor characterized by vacancies and blight. Today, the area includes a coffee shop, restaurants, and the Allegheny branch of the Carnegie Library of Pittsburgh. The next phase of redevelopment is now underway, which will include the nonprofit City of Asylum’s “Alphabet City,” a space that will include a literary center, performance space, classrooms, a restaurant, and bookstore. In addition to commercial development, ACCA develops housing and works to restore or replace vacant lots and buildings within the community. The Bloomfield-Garfield Corporation seeks to re-knit the social, economic, and physical fabric of the Bloomfield, Garfield, and Friendship neighborhoods of Pittsburgh. Founded in 1975, the organization has helped to develop 60,000 square feet of commercial space along Penn Avenue, representing $12 million in business investment. The CDC is also credited with renovating or building more than 200 units of rental and owner-occupied housing. Established in 1979 as a community development corporation, East Liberty Development now refers to itself as a “community based organization” to emphasize its focus not just on physical development projects, but also on neighborhood planning, advocacy, investment, and partnerships. Its 2010 achievements include the release of an updated community plan, the redevelopment of several vacant lots into a play yard, and an $800,000 below-market rate loan to support the development of a large national retail chain which agreed to green building practices, local hiring preferences during construction, and permanent in-store jobs. ELDI plans to use the loan repayments to fund the marketing and promotion of the East Liberty business district, an area that includes small businesses. Lawrenceville Corporation is a community development corporation that focuses on bringing investment to the Pittsburgh neighborhood of Lawrenceville. Its achievements include the development of 33 new townhouses, the redevelopment of a historic public bathing facility into an office space for several professional services firms, and a street-front façades program that has improved over 200 storefronts. Established in 2001, Lawrenceville United (LU) is an inclusive, resident-driven nonprofit organization focused on improving the quality of life of Lawrenceville residents and stakeholders through community engagement and advocacy, community restoration and beautification, and community planning and development. With over 900 members, LU helped steward more than $30 million in area development in 2013 by facilitating a community engagement process designed to build consensus and support. To boost neighborhood engagement and pride, many of LU’s programs also focus on greening, beautification, and restoration. 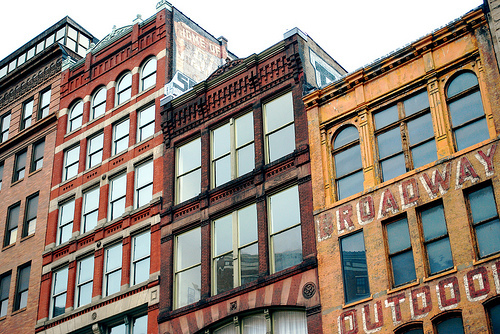 Established in 1965 in response to widespread blight and abandonment, Manchester Citizens Corporation (MCC) focuses on planning, building, promoting, and maintaining Pittsburgh's largest historic area, the thriving Manchester Historic District. Its strategy is unique in that it relies on historic preservation to achieve economic development. For instance, MCC is currently renovating dozens of foreclosed historic properties to create 19 new units. Previous developments include both affordable and market-rate single dwelling, multi-family, and senior housing. The Mount Washington Community Development Corporation (MWCDC) aims to cultivate growth, development, and investment in Pittsburgh’s Mount Washington and Duquesne Heights neighborhoods. Since 2006, it has helped establish more than 16 new businesses in the area, creating more than 100 jobs and bringing millions of dollars into the community. In August 2010, the MWCDC commissioned a ten-year housing strategy that is now guiding its work to create an inclusive, viable and sustainable housing stock, and has resulted in several completed residential rehab projects. MWCDC also serves as a co-steward for Pittsburgh’s newest regional park, Emerald View Park, a 257-acre urban greenspace. Its Emerald Trail Corps program provides at-risk adults job training opportunities while constructing park trails and performing ecological restoration. Founded in 1983 as the Pittsburgh Partnership for Neighborhood Development, Neighborhood Allies focuses on creating vibrant communities in partnership with Local Initiatives Support Corporation (LISC)—together investing $100 million in Pittsburgh neighborhoods and leveraging nearly $300 million in other funds. In 2014, the organization launched as a “new and improved 21st century community development intermediary” with 3 core goals: 1) creating community partnerships; 2) connecting distressed communities with vetted resources; and 3) communicating its progress and success. It runs two grant programs—the Catalytic Program, which makes $25,000-$75,000 grants to support innovative, collaborative, and inspiring ideas to enhance Pittsburgh neighborhoods, and Small & Simple Grants, which makes $15,000 grants to support strategic, small-scale, community-serving projects. The Oakland Planning and Development Corporation began in 1980 with a focus on real estate development in Pittsburgh's Oakland neighborhood, but over time it has expanded into community organizing and workforce development. To date, the group has developed nearly 300 units of affordable housing. In 1989, it started its community-based, healthcare employment training center JobLinks, which, in 2013, placed over 170 people in jobs with an average wage of $10-11 per hour. In 2013, Joblinks added an on-site financial center, the first ever in Pittsburgh, to ensure its workforce clients could also access financial education and counseling. Started in 1990 as a housing and social service lender called CL Fund, Bridgeway Capital broadened its work by adding small business lending in 1994. Serving 15 counties across western Pennsylvania, Bridgeway Capital provides flexible financing and educational opportunities to small businesses and other organizations to ignite economic growth within the region. To date, Bridgeway Capital has made nearly 900 loans, injecting $104 million in capital directly into the region and leveraging an additional $394 million in capital for its borrowers. It has helped create or retain 6,000 jobs since 2001. Established in 2000 by the Northside Leadership Conference, a Pittsburgh-based nonprofit group, Northside Community Development Fund provides loans and financing for businesses and real estate development projects throughout the Northside of Pittsburgh. The loan fund also operates a micro-enterprise fund that makes small loans of up to $35,000 for Northside small businesses with six-year terms and fixed interest rates. East End Food Co-op is Pittsburgh's only member-owned natural and organic food market and has served the community since 1977. The food co-op has over 11,000 members, employs over 90 people, and operates a credit union for its members. Established in 1941, Farmers' Market Cooperative of East Liberty is the oldest continuously operating market in western Pennsylvania. Owned by the participating farmers, the Cooperative is a permanent indoor market, the only year-round market in the city, and one of the only sources of local, fresh meat and produce in winter months. Founded in 1974 by a group of parents who saw the need for an organization that could lend out toys, educate the community about the importance of play, and provide a place for children and their caregivers to play together, the Pittsburgh Toy Lending Library is an all-volunteer cooperative play place and toy library focused on children aged 6 and younger. The cooperative currently has over 150 member families and 400 toys. Established in 2008, Ujamaa Collective aims to provide spaces, opportunities, networks, education, and support for women of African descent to grow as entrepreneurs, artisans, and servant-leaders. The Collective encompasses a retail boutique, an entrepreneurship Preparation Program, an open-air marketplace, and agricultural initiatives, including a 15-acre urban farm in Pittsburgh’s Hill District. HDH Group is a brokerage that provides insurance and consulting services to meet businesses’ risk management, human capital management, and alternative risk needs. Since its establishment in 1982, the company has grown from 6 employees to nearly 100 and now stands as Pennsylvania's largest employee-owned broker with over $300 million under management. Established in 1909, Kerotest Manufacturing Corporation produces industrial valves from plastic and steel for the natural gas and petroleum industries. In 1983, when the large conglomerate that owned the business indicated it wanted to divest, the employees came together and bought the company. In 2007, Kerotest had 110 employee-owners with estimated sales of $20 million. Construction Junction works to support and promote conservation through the reuse of building materials, striving to keep usable building materials out of the landfills and provide them to the community at very low cost. In addition to employing 29 people, the nonprofit supports Goodwill training programs in its warehouse, providing training to people with barriers to employment. In 2011, Construction Junction launched its CJ ReGives program, which provides free building material and furniture to local social service, environmental, and arts -focused nonprofits. In 2014, the program made donations to over 35 local organizations. Founded in 1993, the Green Building Alliance (GBA) was the first U.S. Green Building Council affiliate, of which there are now nearly 80 nationwide. The nonprofit works to inspire the creation of healthy, high-performance places by providing leadership that connects knowledge, transformative ideas, and collaborative action. GBA conducts over 200 events each year and provides a range of in-person and on-line resources, all aimed at building the region’s green building capacity. Its efforts are credited with the development of over 100 LEED-certified buildings in the region, ranking the city 14th in the nation. Growth Through Energy and Community Health (GTECH) aims to cultivate the unrealized potential of people and places to improve the economic, social, and environmental health of communities in Allegany County. GTECH’s projects are based on the premise that the processes involved in planning, designing, and implementing green strategies on vacant land fuel community development and stem urban decay and disinvestment. Since 2006, GTECH has cleaned up 56 acres of vacant land and installed 23 projects on such sites, including community gardens and green play lots. The organization also works with nonprofits, government agencies, and other policy makers to develop legislation that makes community development easier for neighborhoods. Sustainable Pittsburgh is a nonprofit aiming to affect decision-making in the Pittsburgh region to integrate economic prosperity, social equity, and environmental quality by bringing sustainable solutions to communities and businesses. To do so, Sustainable Pittsburgh identifies cutting-edge sustainability trends from around the world and provides a menu of best practice actions that organizations can adopt. It also works to engage regional policy leaders on issues affecting the sustainability of southwestern Pennsylvania, such regional energy planning. Founded in 1957, ACTION-Housing empowers people to build more secure and self-sufficient lives by providing decent affordable housing, essential supportive services, asset building programs, and educational and employment opportunities. Since 1985, ACTION-Housing has developed or assisted in the development of over 4,500 units of housing for the elderly, people with disabilities, homeless individuals, veterans, and working families. It also has a Family Savings Account Program, which will match, dollar for dollar, participants’ savings that will be used to purchase a home, educate themselves or a child, or start a new business. Since the program’s inception in 2002, 416 people have reached their savings goals. Established in 2005 by three urban farmers, Grow Pittsburgh is an urban agriculture nonprofit focused on teaching people how to grow food and promoting the benefits that gardens bring to neighborhoods. The nonprofit runs educational programs at Pittsburgh schools, a summer intern program for teens, and an adult intern and apprentice program. Crops are grown at the nonprofit’s two farm sites by Grow Pittsburgh farm managers, apprentices, interns, and volunteers, and sold at various places, including two independent farm stands which serve the fixed or low-income populations living around the sites by selling at below market rates and accepting EBT/SNAP and similar payments. In 2010, the organization launched a community gardening program that provides technical, educational and material assistance to communities interested in establishing community gardens and helps connect gardeners across the region to share resources and lessons learned. Ambiance Boutique is a high-end women's consignment store with 2 Pittsburgh locations that is 100-percent owned by the nonprofit Bethlehem Haven, a group that provides emergency shelter, transitional housing, medical support, and employment services (Project Employ) to Pittsburgh-area women. Earned income from the stores make up about 22 percent of Bethlehem Haven’s total $3.6 million in annual revenue. Founded in 2012, InterSector Accelerator supports new social enterprise ventures through a twelve- to sixteen-week collaborative process focused on helping entrepreneurs validate their business model, make community connections, and discover market opportunities. The Accelerator is part of Idea Foundry, a nonprofit innovation acceleration and commercialization organization founded in 2002 that now has 150 companies in its portfolio and is designed to catalyze high-potential, innovation-related jobs in the life sciences, entertainment and education, social enterprise, advanced materials, and water sectors. Based in Pittsburgh, Life’sWork of Western PA seeks to help people with disabilities and other employment barriers achieve independence and dignity through employment opportunities. Founded in 1927, the nonprofit now serves over 2,000 people a year. Its Business Services division provides janitorial, mailing, packaging assembly, and distribution services to area businesses, while providing training and employment opportunities for clients. In 2013, its enterprises earned over $2 million, representing over 40 percent of its total $4.9 million in total revenues. Manchester Bidwell operates a range of programs designed to create empowering educational environments for adults-in-transition as well as urban and at-risk youth. The nonprofit’s educational model includes three core components: 1) youth arts programming; 2) adult career training; and 3) social enterprise. Current social enterprises include MCG Jazz, which preserves, promotes and presents jazz music through live concerts, archival recordings and educational programming; and The Drew Mathieson Center for Horticultural and Agricultural Technology, which trains people in green industries and generates revenue through the sale of orchids and other specialty crops. Founded in 1968, Manchester Bidwell’s annual revenues now exceed $3.3 million, less than $600,000 of which comes from contributions and grants. To help other communities replicate the model, it launched a subsidiary, the National Center for Arts and Technology (NCAT), which now supports eight operational affiliates outside of Pittsburgh. Founded in 2001, the Union Project began as a dilapidated, vacant historic church building that more than 1,300 volunteers repurposed into a community hub designed to provide an affordable, safe home for grassroots entrepreneurs, artists, nonprofits, and people of all faiths. Its diverse programming is credited with engaging nearly 25,000 people a year. In addition to offering ceramics classes, workshops, and open studio hours, Union Project includes a Ceramics Cooperative to assist emerging artists. Its affordable space rental program is credited with creating nearly 100 jobs and incubating a diverse network of partners including community leaders, artists, micro-entrepreneurs, small businesses, and nonprofits. Formed in 1988, the Pittsburgh Community Reinvestment Group (PCRG) is a coalition of community leaders working for economic justice, equitable investment practices, and the deployment of sufficient financial resources to revitalize communities throughout Pennsylvania’s Allegheny County. In 2011, PCRG launched the Community Bankers Collaborative Council, which brings communities and small local banks together to identify issues and work on solutions. That same year, it also initiated its Reimagining Communities Initiative (RCI) to build capacity within distressed neighborhoods. As of March 2015, RCI raised over $1 million and leveraged an additional $6 million, inventoried the condition of around 5,500 parcels, rehabbed over 100 properties, and provided more than 400 individuals with financial, foreclosure, or homebuyer counseling. PCRG’s core work also includes research and analysis to inform the community about trends in local and national lending and financial regulations. The Pittsburgh Central Keystone Innovation Zone (PCKIZ) is a consortium of higher education institutions, businesses, government agencies, and community organizations aiming to ensure the neighborhoods in central Pittsburgh can participate within the region’s knowledge-based economy. To do so, the group provides a combination of tax incentives, entrepreneurial resources, educational and internship programs, networking events, and technology showcases designed to boost technology and economic development activities. As of 2015, 41 startups in the zone were benefiting from access to tax credits, business capital, paid interns, and networking opportunities. PCKIZ is also managing and overseeing the city’s nascent Pittsburgh Wealth Building Initiative (PWBI), which aims to catalyze the creation of employee-owned/community-based businesses in low-income neighborhoods that meet the procurement needs of area anchor institutions and create new pipelines to connect residents to job opportunities at those institutions. Incorporated in 1946, the Urban Redevelopment Agency of Pittsburgh (URA) undertook the first privately financed downtown redevelopment project in the United States— Gateway Center. Since then, the URA has constructed and rehabilitated tens of thousands of homes, reclaimed thousands of acres of environmentally contaminated brownfield and riverfront sites, and assisted hundreds of businesses in neighborhoods throughout Pittsburgh. Its Center for Innovation and Entrepreneurship has a range of loan programs designed to help finance commercial real estate and small and medium size business development, as well as a network of technical assistance providers and partners to help businesses start, improve, and grow. The Bayer Center for Nonprofit Management at Robert Morris University aims to help build stronger, more knowledgeable nonprofits. To do so, it provides education, consulting, coaching, and research, all focused on enhancing nonprofit management. Since its establishment, the center has educated over 6,500 people and provided consulting services to over 1,000 clients, including human service, arts, faith-based, community development, environmental, and educational organizations with budgets ranging from $100,000 or less to more than $50,000,000. Technology Consulting in the Community is a special university-community learning partnership. Non-profit organizations, schools, and government agencies improve their technology use, management, planning, and integration by working with Carnegie Mellon students. Students develop technical consulting and management skills while collaborating on site with a leader of a local organization. Formed in 1998, to date the program has worked with hundreds of organizations through over 340 partnerships. Launched in 2001, The Big Idea Bookstore is a worker-owned cooperative that sells radical and progressive literature. The enterprise includes a café featuring food and drinks from local, organic, seasonal, fair trade, or sustainable sources whenever possible. With about 20 worker-owners, the co-op also distributes free literature pertaining to local community organizations, events, and projects and hosts a range of events and discussion series.